Paraformaldehyde-fixed, paraffin embedded Mouse intestine Antigen retrieval by boiling in sodium citrate buffer (pH6.0) for 15min Block endogenous peroxidase by 3% hydrogen peroxide for 20 minutes Blocking buffer (normal goat serum) at 37°C for 30min Antibody incubation with Ubiquitously expressed transcript Polyclonal Antibody, Unconjugated at 1:200 overnight at 4°C, DAB staining. UXT is a novel protein, highly conserved in mouse. It interacts with the N terminus of the androgen receptor and plays a role in facilitating receptor-induced transcriptional activation. 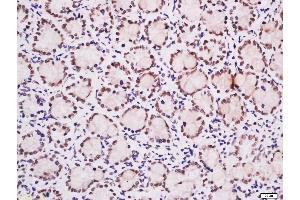 It is abundantly expressed in tumor tissues and is likely to be involved in tumorigenesis. Synonyms: Androgen receptor trapped clone 27 protein, ART 27, Protein UXT, Ubiquitously expressed transcript, Ubiquitously expressed transcript protein, UXT_HUMAN.